Powers/Abilities: Grithstane was a powerful sorcerer, who could summon forth demons from the Blood-Jewel, and could bring shadows to life to slay their shadowcaster. History: (Monsters Unleashed#9/2) - Grithstane was a sorcerer for an unnamed queen, and he greatly desired to possess her mystical blood-jewel. When the dwarf Titan stole the blood-jewel from the castle, the queen ordered Grithstane to retrieve it, or be killed. Seeing his opportunity, Grithstane cast a death-cantrip on the blood-jewel, causing a three-headed demon to emerge in the hopes that it would slay Titan, leaving the jewel unattended for Grithstane to recover. He also cast a spell upon the queen's shadow so that it came to life and strangled her, taking her out of the way. However, Titan triumphed over the demon with the aid of the centaur Equinus. As Grithstane prepared to summon another demon, one which was immune to both swords and sorcery. 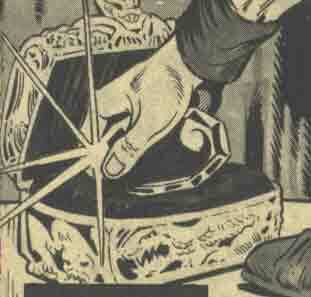 Just as he was completing the spell, Titan hurled the jewel into Grithstane's window, having had enough of the item. 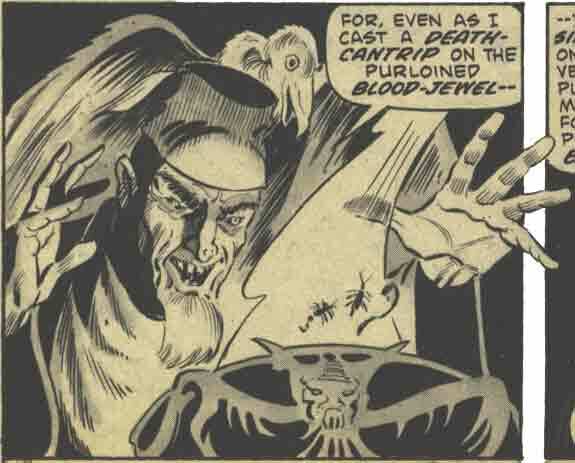 To his horror, the demon Grithstane summoned emerged from the jewel to attack Grithstane and his vulture Nironus. When the queen's guards arrived in Grithstane's chamber they found it empty, with only the jewel covered in blood and Nironus' feathers. Comments: Created by Doug Moench and Don Perlin. 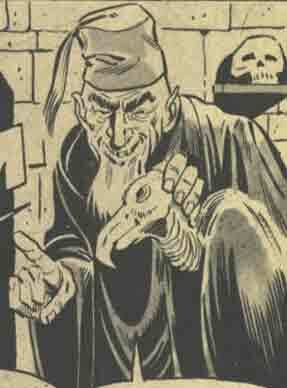 Grithstane and Nironus were originally the names of characters from "Parchments of the Damned," the first novel which Moench wrote-- which was sold, but unpublished. Since the novel never reached the public, Moench kept using the names throghout his career. The Blood-Jewel was an enchanted gemstone, first seen in the custody of the queen, but long-desired by Grithstane. After it was stolen from the queen by Titan, Grithstane caused it to release a three-headed demon to slay Titan and his ally Equinus, but the duo prevailed over the monster, slaying it. Just as Grithstane had cast a spell to release another demon which was immune to both swords and sorcery, Titan hurled the gem back into the castle, fearing what other problems it might bring him. 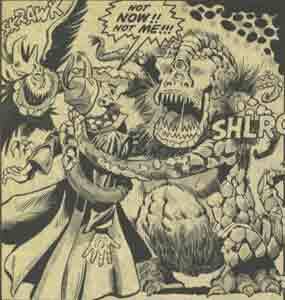 When the demon emerged from the gem, it immediately assaulted Grithstane and Nironus. By the time the castle's guards arrived in Grithstane's room, they only found a few of Nironus' feathers, and saw that the demon had returned to the gem. This unnamed queen was the owner of the Blood-Jewel, until Titan stole it from her bedchamber while she slept. The men of her castle had often hunted Equinus. Desiring the Blood-Jewel for himself, Grithstane cast a spell upon the queen's shadow to animate it, and the shadow strangled her to death. 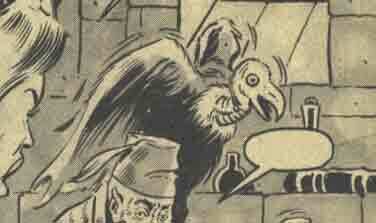 Nironus was the ever-faithful vulture lackey to Grithstane. He was seemingly Grithstane's only friend, and Grithstane would narrate his plots to Nironus. Nironus was apparently dragged inside of the Blood-Jewel, possibly to its death.